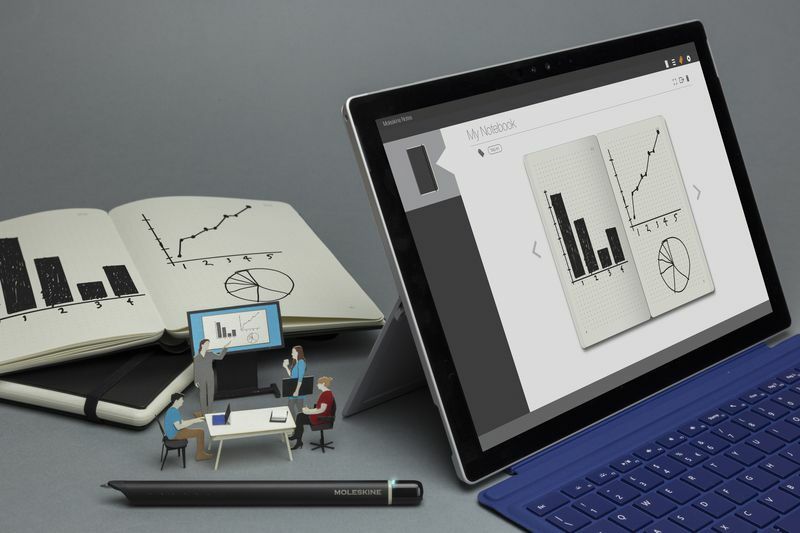 Moleskine & Microsoft are both well known in their fields, but are not possibly the most obvious collaborators. There is something qualitatively different not only in the experience of using pen and paper, but in my experience, in the actual work that is produced. As a writer I have gone through several iterations of how I write and the instruments that I use. Like most people I started as a kid writing things with a pencil – I’m not sure any of that survives. The first book I wrote was in Biro, or ballpoint pen, and it was me doing a 5 year old remix on my Doctor Who Dinosaur book. I was in my early teens when we got an Olivetti typewriter and I got myself a ream of paper and some ribbons, and really began to type long-form stories. Shift to a single line LED screen with a memory and an ability to save files onto a floppy disc, and the scope for what I could write again changed for me. As the storage capacity for the devices I used expanded so did my ambition. My first computer blue skied the whole thing for me, and it has just kept going from there. But sometimes I like to go back to old methods of writing because there is a certain rhythm and pace that you develop as dictated by the equipment you are using. When you write longhand it takes a lot longer, and the size of the pages are different. The muscles used both physically and mentally seem to move around, and so the work generally benefits from the change in pace. Microsoft benefited in a lot of ways by having a protracted period of being the ugly stepsister, and while they still have a ways to go before their products and services really hit the mark, some things really do resonate with me when I read about them. One such thing is the collaboration with Moleskine, which has reframed something that a lot of writers do anyway in a technological setting that serves the process and doesn’t look to force something artificial on the user. It seems very organic, and very useful. There is also the ability to collaborate with up to six friends or colleagues by linking the pens together. The platform really does seem to expand what you can do with your tools, and this is always a great thing. For me, my handwriting is pretty terrible, and being able to transport it with minimal effort onto an electronic page would be a great thing – transcribing can be a bit of a nightmare. The App from Microsoft is reportedly very intuitive, and sidesteps a lot of the issues that plague other similar Apps. Unusually with Microsoft, it also apparently very easy to cross-post your notes across a number of different platforms. Any Windows 10 users will have experienced how unfriendly Microsoft systems can be when playing with other products. Watches never really caught my imagination, and slightly larger phones become invisible in their uniqueness pretty soon after you start to test drive what’s under the hood. Boring reiterations of everything that came before, just differently scaled, or installed into something that doesn’t need software running it, can be very disappointing, but discovering something that seems to come from the same place as your own creative process really does resonate. The price point is pretty reasonable, and it doesn’t look to be an expensive piece of equipment to maintain, so who know, pretty soon I might be smart writing some of these posts.